Just take the simple at-home DNA test and within a few weeks you receive personalized nutrition and fitness recommendations that work best for your body. Get ready to take control of your health. Rather than taking a one-size-fits-all approach to weight loss, you can cook smarter, eat healthier, and exercise more effectively because you have data from your DNA to help you make more informed decisions. Plan an individualized workout routine that takes full advantage of your physiological capabilities. DNA fitness testing can unlock the information that takes the guesswork out of which types of training your body responds to. 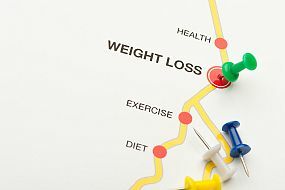 With the personalized report you receive from our DNA test, you have essential information you need to tailor a weight-loss program that can achieve real results. Unlike diet books and pre-packaged meal plans, the fitness program created by results of DNA testing can offer customized solutions to help you realize a healthy weight since it’s based on your unique genetic information. Due to state regulations, currently not available in New York and Maryland. This product is not intended to diagnose, treat, cure, or prevent any disease. What genes are analyzed with the HomeDNA Healthy Weight test? Our lab analyzes genetic markers (SNPS) that have been shown through external research to be related to various ways the human body processes food, nutrients and physical exercise. Will I ever need to be re-tested? No. 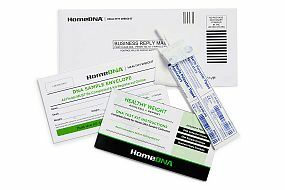 There is no need to retake the HomeDNA Healthy Weight test as your genes will never change. In terms of testing DNA, your DNA is the same throughout your entire life. This is a once-in-a-lifetime investment that takes away the guesswork when it comes to dieting and exercise. What information is included in my report? Your HomeDNA Healthy Weight report contains nutrition and exercise recommendations specific to your genetic test results (i.e., your DNA). The nutrition information discusses in easy language how much protein, carbohydrates and fat you should consume daily, which nutrients for which you may be at risk of deficiency, and which foods are good sources of those nutrients. You will learn how your body responds to fat, protein and carbohydrate intake in relation to how you use them for energy, and thus, how best to eat in order to lose body fat.Your HomeDNA Healthy Weight report also indicates how likely you are to use fat for energy during different types of exercise. It will give you specific information about exercises that are best aligned with your genetic test results: which types, at what intensity, for how long, and how often. How dependable are the results? We have laboratory protocols that ensure very high accuracy, and so you can be sure your test has been processed correctly. Your genes play a big role in your body composition but it’s also important to realize lifestyle and diet play a significant role as well. HomeDNA™ empowers you with valuable information contained in your own DNA and is brought to you by DNA Diagnostics Center (DDC). Established in 1995, the DDC was founded on the belief that technological advancements in DNA testing should translate to services that are accessible and affordable to everyone. They have built an international reputation based on their commitment to reliability, innovation, and value by offering DNA testing services for paternity and other family relationships, forensics, animal breeders and veterinarians, and now wellness-inspired consumers. Thousands of people across the world use our services to make their lives simpler, more pleasant, and more productive. 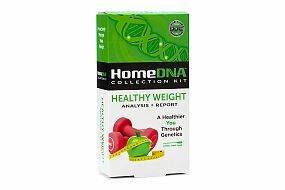 Interesting Use of DNA I liked the ancestry DNA product and was intrigued by the healthy weight product. I looked around at other DNA products and decided to do this one partially based on price and reviews I had read. The report is very thorough. Diet plans and exercise plans are given. I will be reviewing all of this with my trainer and see how we can adjust what I am doing.